A single graphic gives great perspective on just how massive the United States economy is relative to other nations. 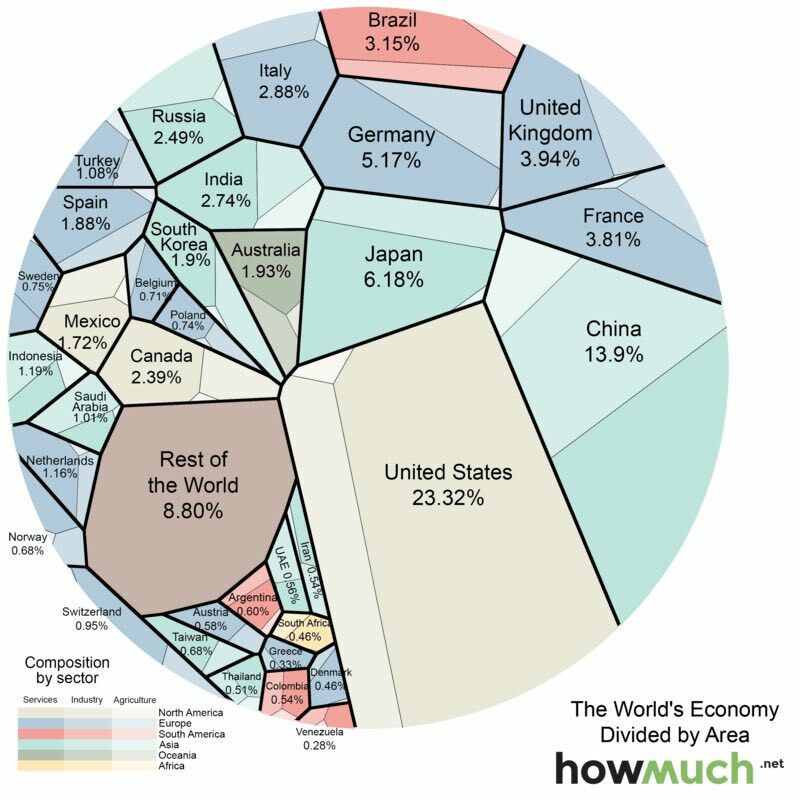 Released by howmuch.net, and called a Voronoi Diagram, it represents each country’s share of the world economy as a slice in a global circle. America’s share takes up the largest amount by far at 23.32 percent, followed far behind by China at 13.9 percent. Japan is third at a distant 6.18 percent, followed by Germany, France and the U.K. The United States only has about 5 percent of the world population, yet it dominates the global economy. China, with almost three times the population, still has a long way to go. The diagram from the “cost-information website” also divides the country’s share into sectors, service, industry and agriculture – and this is where it gets less than stellar. The vast majority of America’s economy is service-based, with the industrial and agricultural sector a much smaller share. The US economy is mostly composed of companies engaged in providing services (79.7% compared to the global average of 63.6%), while agriculture and industry make up smaller-than-average of portions of the economy (1.12% and 19.1% compared to averages of 5.9% and 30.5%). The next largest economy, China, is roughly balanced between industry and services (though the service sector is growing at a faster rate), with a 9.1% contribution from agriculture. In this sense, China is a bit of an anomaly: other rich countries have service sectors that greatly outweigh both industry and agriculture. Over the past several decades, China has leveraged its competitive advantage and designed industrial policies to incent manufacturing in the country. But as China grows, it will continue to transition to a service-based economy. Similarly, India will see a decrease in agriculture’s contribution to its GDP and an increase in the size of the service sector. Over time, the service sectors of developed nations have tended to grow relative to the other sectors. But are there limits to this trend? What is the natural size of each sector?